Christmas is, without a doubt, my favourite time of the year. It always has been. Anyone who knows me well will tell you that I basically eat, sleep and breathe Christmas. Infact I have always sympathised with those people you see on TV in documentaries with names like "Extreme Christmases" who take it that bit too far...covering their homes in mechanical Santa's year round or celebrating Christmas with turkey dinners and self-given gifts every single day of the year...I've always kind of thought "I could see how that could happen..."
But despite how much I love it, it is also...without a shadow of a doubt...the time of year when the pressure is really and truly on us all to be our happiest, brightest, and most thankful selves. Everywhere you look, someone is reminding you of how Christmas is for those less fortunate...reminding you of those who, for various reasons, are having a difficult Christmas...reminding you of those who sadly didn't survive to see this Christmas...and laying the guilt on thick that we all must be thankful. We must be grateful for all that we have. WE MUST ENJOY OURSELVES AND BE HAPPY. But the thing is...sometimes, no matter how hard you try to be grateful and happy and merry...sometimes there are things going on behind the scenes which make it too hard. 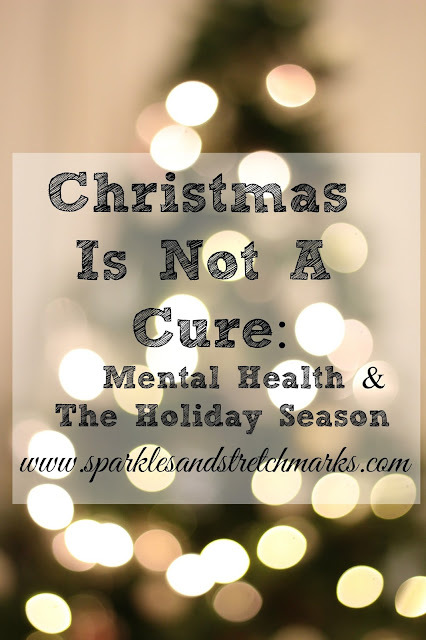 There are so many less-than-perfect aspects of life that don't fit into the Christmas Card Image of perfection that we're all readily exposed to on social media in December - things that don't take a break just because it's Christmas - health concerns, money worries, grief...none of these things stop because it's the holiday season. Nor do mental health problems. I think I thought mine would...because of how much I love the Christmas season, and how happy it usually makes me I think I expected that my mental health issues would do the decent thing and duck out for a few weeks break leaving me to get on and enjoy the festivities as I always do...my therapist took a two week break over Christmas so why wouldn't my anxiety, OCD and all of my other problems do the same right?! Well no, I was wrong. I'd love to pretend that my Christmas was perfect. That it all went smoothly, like all of the obsessive notes and plans and to do lists I spent months making meant that it should have done. That I enjoyed every magical, wondrous moment of it. That the smiles on my kids faces on Christmas Morning took away any and all sadness I have ever felt, and were simply all I needed to enjoy myself free from worry and any negative emotion at all. Don't get me wrong...I made sure that I pretended they did. I made sure that the kids had a lovely time, that everything was done as it was supposed to be, that I made all the right noises and said all the right things. And if you saw our little Christmas video or round up post the other day, you'd never know any different. But for the sake of those of us out there who suffer with their mental health...with anxiety, with depression, with panic and the many many other forms that these problems can take...I won't stay quiet about it on here. I'll let you in on the secret parts of my Christmas that I desperately try to keep otherwise quiet. I did not enjoy Christmas. It was easily the worst Christmas I've ever had...by a long shot...I had expected it to the best because the kids are older now and more aware, everyone told me that Christmas gets better as the kids get older...but those people aren't usually accounting for the kinds of problems people like me have. So here's the truth...behind those pictures you saw of my kids making Gingerbread houses on Christmas Eve, behind their happy smiling faces unwrapping the presents I'd worked so hard for months to ensure they had, behind the grins on the family photos on my own face and everyone elses...here are the parts that you didn't see. I had a screaming argument with Jon on the same day because he just did not understand why I was freaking out so much about the turkey being ready that I couldn't focus on anything else....because he doesn't how my OCD works and why it was such a massive deal to me...and the argument we had lasted so long that we missed the Church service we attend every year....and it basically wrote off everything nice we ever do on Christmas eve. And I spent my New Years Day this year not making phone calls to loved ones to wish them Happy New Year, but talking to the Samaritans because some things ...some problems and concerns...just can't be discussed with anybody else when your therapist is on their Christmas break and you feel as though you are literally going insane and nobody else understands. The thing is...truths like this have no place at Christmas, nobody has any time for them...people would rather pretend that these things don't happen...at any time of year but especially not at Christmas. But I'm here to tell you that they do. I spend weeks if not months every year planning our Christmases out down to the last tiny detail in an effort to keep an element of control over things...to make sure that everything goes right, to make sure that everybody has the perfect Christmas...and any slight deviation from plan sends me into a spiral of OCD and panic. And people may think thats silly and superficial because why does it matter if Christmas is perfect? But it matters to me and my troubled mind...because otherwise my mind tells me "But what if this was the last Christmas for this person or that person or even for you? And what if that last Christmas was ruined, because YOU messed up the turkey"
It might sound silly...but thoughts like that get into my head and mess with my mind like you wouldn't believe. But it wasn't all bad....despite looking forward to Christmas so much, it actually ended up being New Years Eve that I enjoyed most of all. I don't usually care for New Years but this year it was calm and fun, and there was one particular moment at the end of the night when I was sitting on the sofa laughing with my two biggest boys over Snapchat filters that I realised... I finally felt like myself again, ...for the first time all Christmas I felt happy. And it reminded me that even when things don't go smoothly and perfectly as we'd hoped, that usually there's a happy ending if we can just hold on for long enough...otherwise, it's not really the end.